Festoon bulbs. 31mm led bulbs will ususally fit in to the same fitting a a 36mm bulb. 42mm bulbs will fit from 40-44mm fittings. 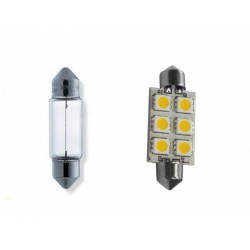 31mm 1 Watt led festoon fits interior lightsBrightest festoon availableLight up the inside ..
You are buying one 37mm Led bulb with 6 High power wide angle chips.This has a built in vol..
You are bidding on one 44mm Led bulb with 30 High power wide angle chips. This is perfect for marine..
You are bidding on one 44mm Led bulb with 6 High power wide angle chips.This has a built in volt..
You are buying one 31mm Led bulb with 4 High power wide angle chips (1W worth of leds)..